Cirque du Soleil returns to Florida this September and October 2016 to present its newest touring arena show, “OVO,” never before played in Florida. The show will be in Orlando, Estero and Jacksonville as part of its global tour. 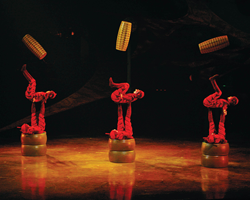 Cirque du Soleil returns to Florida this September and October 2016 to present “OVO,” the newest touring arena show. "OVO is a headlong rush into a colorful ecosystem teeming with life, where insects work, eat, crawl, flutter, play, fight and look for love in a non-stop riot of energy and movement." March 16, 2016 – Cirque du Soleil returns to Florida this September and October 2016 to present its newest touring arena show, “OVO,” never before played in Florida! Thrilling more than 4.5 million people worldwide since the show premiered in 2009, OVO will embark on a new journey, performing the same captivating production, now in arenas, giving more people the opportunity to enjoy a Cirque du Soleil show in their home town. The cast of OVO is comprised of 50 performing artists from 12 countries specializing in many acrobatic acts. One highlight of OVO is the stunning Flying Act where group of scarabs soar high above – from each corner of the stage – and land together on a platform in the middle. Advance tickets for OVO are now available online exclusively to Cirque Club members. Cirque Club membership is free and benefits includes access to advance tickets, special offers and exclusive behind-the-scenes information. To join, please visit http://www.cirqueclub.com. Tickets for the general public will be available starting Friday, March 25th, 2016 at http://www.cirquedusoleil.com/ovo. Adult tickets start at $35 and child tickets start at $25 (subject to change). OVO is presented by Visa Signature®. DHL and ACTIVEON Action Camera are the official sponsors. The company has brought wonder and delight to more than 160 million spectators in more than 400 cities on six continents. Cirque du Soleil has almost 4,000 employees, including 1,300 performing artists from about 50 different countries. For more information about Cirque du Soleil, visit http://www.cirquedusoleil.com. To find out more about the ONE DROP Foundation, visit http://www.onedrop.org.